The 10 x 12 Clear Vinyl Tarp from TarpUSA™ is 20 mil thick laminated polyethylene and have a weight 18 ounce per square yard. These vinyl tarps offer a window-clear view with no thread lines to obstruct vision and are typically used for canopy tent sidewalls, storm windows, porch enclosures and industrial protection. This clear tarp is Made-In-The-USA, and its finished size measures 10 feet by 12 feet, while the finished measured size is roughly 2% smaller. The material is waterproof, mildew resistant, tear resistant and acid resistant. The material is UV-stabilized for longer life. 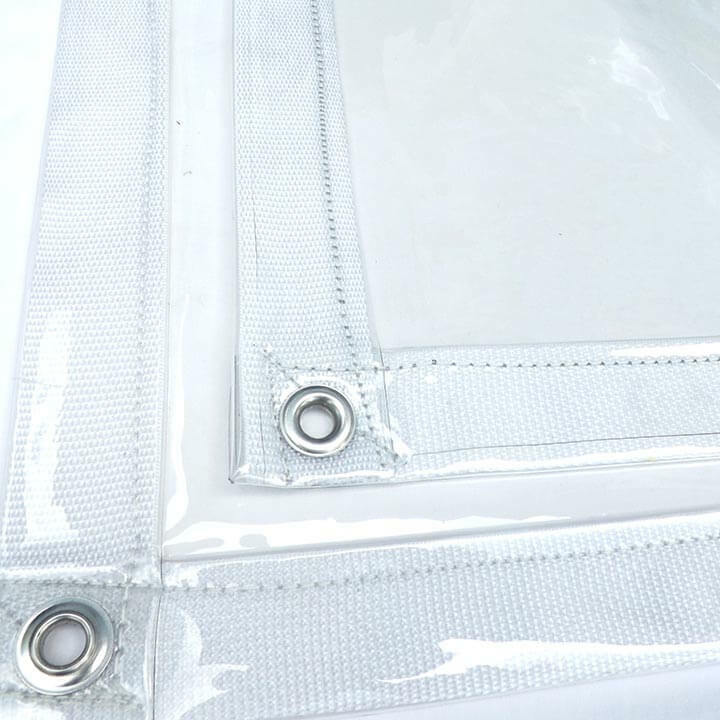 The clear tarp come with metal grommets installed about every 18 inches along each side for your convenience. For large quantities of 10 x 12 clear vinyl tarps or bulk-shipping rates, please call us at (800) 352-6609.